I was walking home when I saw a stellar's jay and just the day before I had told a fellow artist that I wanted to paint one. I had been itching to do another pour. I am new to flow painting but I love it. It liberates me in a way. I am still fairly new to painting. I have probably put about 2000 hours into learning. Only another 8000 and I can call myself proficient! I have spent more time procrastinating and resisting my creative impulses. Why? Afraid of doing it wrong. Or doing it right and never being able to maintain the facade of knowing what the hell I am doing? I am grateful for flow painting and the way it has given me permission to be messing and less rigid. I am ready to have some fun! 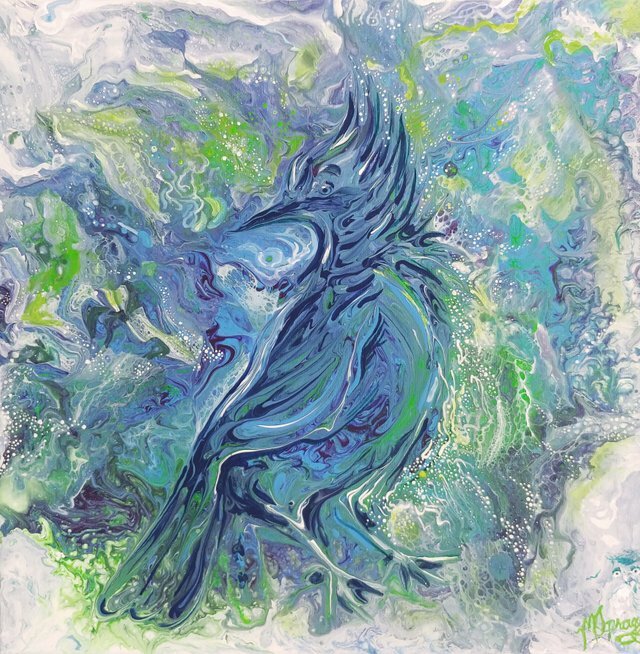 Stellar's Jay acrylic flow painting very beautifull, succes always for you, Greetings from @happysmart for you.